Roman coins commemorate the founding of Constantinople which was one of the most important events in the history of the Roman Empire. Victory left, wings half spread, right foot on prow, holding scepter in right and resting left on shield. Palm branch in field left. 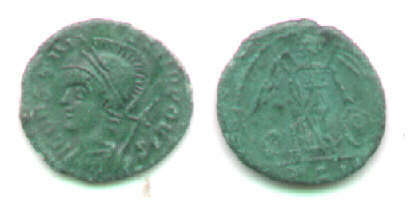 TRS in exergue, for the Trier mint, second officina. RIC Trier 563. 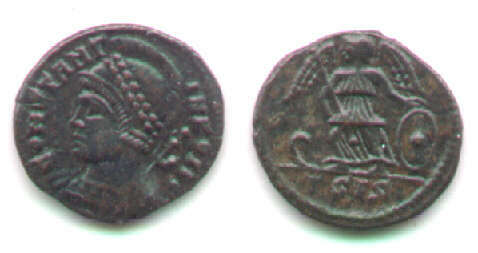 Struck AD 333-34. Failmezger 363 (this type, earlier and larger) and 369 and 377 (later and a bit smaller). "Constantine's city," conceived in 324 and dedicated in 330, marked a major shift toward the east and created a new capitol city that would endure for over eleven hundred years. Some historians even use it as the divide between the "Roman" and "Byzantine" empires. The foundation was commemorated with a huge issue of coins from every mint naming CONSTANTINOPOLIS and simultaneously from every mint an equally huge issue naming VRBS ROMA, both alongside a third huge issue, GLORIA EXERCITVS, which was issued in the names of the emperor (Constantine) and his sons (Caesars Constantine II, Constans, and Constantius, as well as Delmatius). 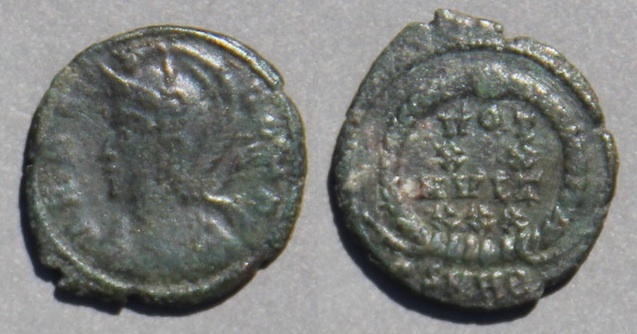 Fortunately for collectors interested in history these two commemorative types are among the most common Roman coins of all (See the first two coin images), so they are inexpensive, even in excellent condition. 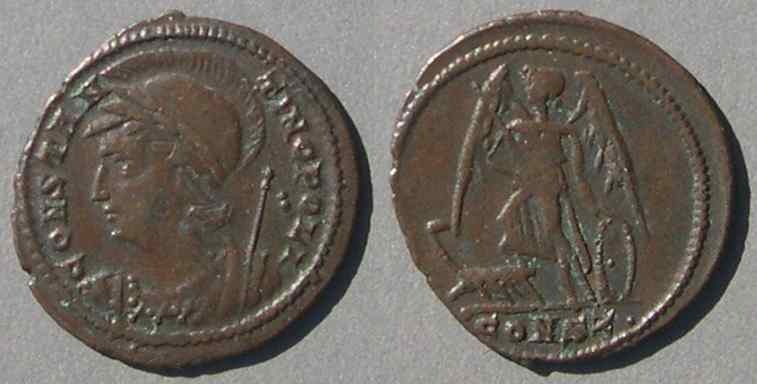 Much less well-known are the other anonymous commemorative types that mention Rome or Constantinople (below). Short History: Prior to 324 Constantine had ruled in the west and Licinius in the east. Constantine became sole Augustus when he defeated Licinius in 324 with a major naval victory--thus the prow (clearer on an example below). Actually Crispus, Constantine's first son, was the admiral, but he had fallen out of favor in 326 and been executed before this type was issued. Because of its superb location, Constantine chose the small city of Byzantium as the site of his new capital and named it after himself. It is now known as Istanbul in Turkey. The existing city was greatly expanded with a massive building program including new walls and was formally dedicated in 330. The coin type was struck at all mints from 330 until the death of Constantine in 337, and it continued until 340 when Constantine II died (He was ambushed while invading his brother Constans' territory!). Constantinople controlled both the land route from Europe to Asia (which was only a mile east across the Bosporus Strait) and the sea route from the Black Sea to the Aegean Sea. Furthermore, it had an excellent harbor (The "Golden Horn") and was easily defended with a relatively short land wall and a chain to the walled Galata across the entrance of the the harbor. If you wanted to control Italy, Rome had an excellent location. 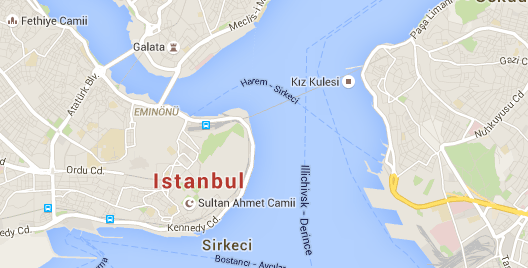 If you wanted to control an empire encompassing both Europe and Asia, no location was better than Constantinople. Rome had begun to lose importance even before the foundation of "Constantine's city" because Rome was far from the action on the frontiers. Under the First Tetrarchy of Diocletian (who resided in the East, not Rome) the western Augusti and Caesars battled against barbarians in Britain and Germany, not Italy. The apparent intention of Constantine to move the capitol east greatly disturbed the Senate and people of Rome, prompting a nod to them with the "VRBS ROMA" issue alongside the "CONSTANTINOPOLIS" issue. The wolf and twins (Romulus and Remus) of the foundation legend of Rome. ΓSIS for the Siscia mint, third officina. 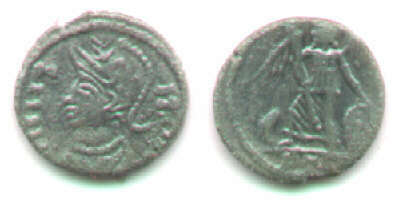 RIC VII Siscia 222, struck 330-333. Failmezger 364 (this type, earlier and larger) and 370 and 378 (later and a bit smaller). The two main types above can be found from numerous mints. There are numerous mintmark variants. Sometimes other symbols are found in the place of the palm branch on the CONSTANTINOPOLIS type and from some mints the legend is spelled without the terminal "S": CONSTANTINOPOLI. 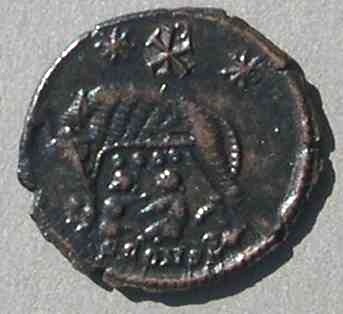 Similarly, the VRBS ROMA type was issued from numerous mints with some differences in details, especially with symbols between the stars above the wolf. Some of the many varieties are illustrated below. Note for collectors: These two types are readily available in excellent condition from numerous mints. 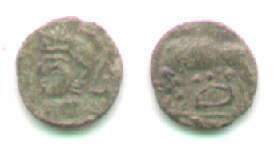 They are among the least expensive ancient coins. A few have field marks that add interest, but only the chi-rho variety commands much of a premium. Rome was also commemorated (at Constantinople only) in an issue of 330 on two smaller anonymous types with obverse POP ROMANVS. Laureate head of Roma left, cornucopia over left shoulder. RIC Constantinople 22 "Special issue for the dedication of the city." CONS over I [officina 10] between the towers for the Constantinople mint. RIC Constantinople 21 "Special issue for the dedication of the city." Which bridge is it? There have been numerous speculations, but no convincing argument. Perhaps the Milvian Bridge in Rome, so important in the rise of Constantine, has the greatest claim. Note for collectors: The two types above are scarce compared the the main types and in demand. They are readily available in medium grade, but excellent examples command a large premium. 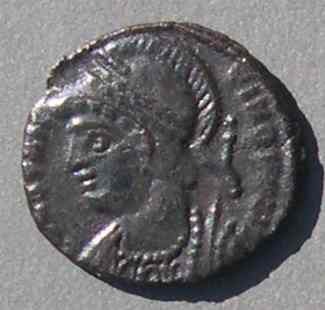 Constans, struck 337-340 as Augustus. Two soldiers, each holding spear in outer hand, with one standard between them, resting inner hands on shields. This particular example has the Christian symbol chi-rho on the standard (which is common from this mint, Siscia). This type is one of the most common Roman types of all. It was issued at all mints in vast numbers at the same time as the two main commemorative types. It is no surprise that occasionally commemorative obverses were combined with GLORIA EXERCITVS reverses. Whether that was intentional or accidental has been a matter of debate. When the mints began to issue this legend with the one-standard reverse the size of the coins decreased slightly and the quality decreased significantly and this was also the case for the two main types which continued to be issued, however with no distinguishing type change. Given the vast volume of coinage spewing from the mints, it could be argued that these combinations of commemorative obverses with non-commemorative reverses are simply the result of sides occasionally being paired incorrectly--mint mistakes called "mules." However, other possible mules do not seem to occur. The commemorative reverses are not (never?) 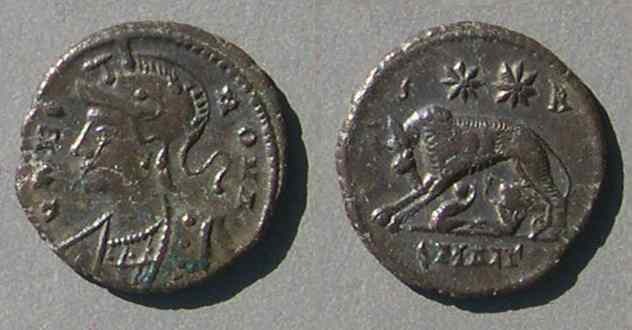 paired with obverses naming the emperors, which GLORIA EXERCITVS coins have. City commemoratives with the two-standard reverse are unlisted (but might occur as ancient imitations). Coins with the one-standard reverse (next) are scarce, but not rare. So, these are probably not mistakes--just scarcer official types. which is usually a bit smaller. Note for collectors: These are much less common than the main types, but command only a small premium anyway. However, because the quality of flan and strike is lower in the one-standard era, these are much harder to find in near-perfect condition than the two main types. The most interesting mule is of one commemorative's obverse with the other's reverse. This is a mule. Here the CONSTANTINOPOLIS obverse is combined with the wolf-and-twins reverse proper to the VRBS ROMA obverse. This particular coin was published in SAN XI.2 (1980) page 37 as potentially official. Subsequently an expert on the issue, Pierre Bastien, saw it and told me he thought it was an imitation. It has good style and lettering, but he assured me this is not the official style of Lugdunum, in spite of the clear PLG mintmark of Lugdunum (see RIC page 140). Then this piece was cited in A Survey of Numismatic Research, 1978-1984, page 288. The existence of official mules of this period was the subject of several articles in SAN (VI,1 (1974), pages 8 and 15; VI.3 (1975) page 42; X.2 (1979) pages 20-21; X.4 (9179) page 60). After 30 years studying the matter, I think no mules of these types were intentionally issued, but I do not rule out a simple mint error in some cases. Lugdunum issues are sometimes smaller in diameter than issues from other mints. Another 14 mm example (the same size as this one) that looks official is illustrated below. 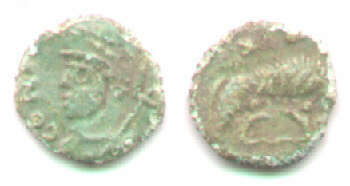 However, other coins with this obverse and reverse combination are clearly ancient imitations (See below under "Imitations"). The usual CONSTANTINOPOLIS reverse has no legend. There is a very rare type of 337-340 explicitly labeling Victory. RIC VIIII Rome 20, 31, 42 officina E only. Struck 337-340. This Victoria type is attributed to 337-340, partially because it also appears (extremely rarely) with the obverse of Constantine II as Augustus. 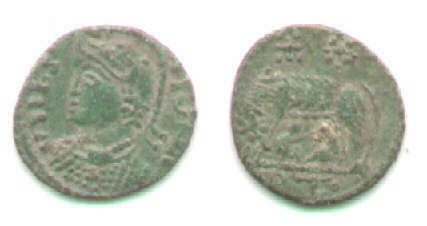 The usual VRBS ROMA type has a very rare variant with extended obverse legend which is attributed to 337-340. Two stars above, wreath between. 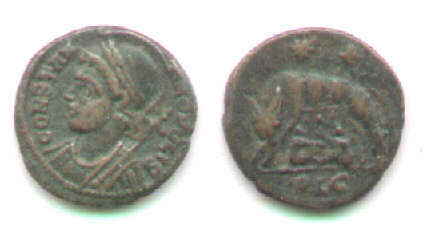 RIC VII Rome 408, struck 337. "r5", extremely rare. Note for collectors: These are so rare you may have to wait years or decades before seeing one offered. The commemorative types continue to be issued in high volume until the death of Constantine II in 340. John Kent, in RIC VIII on the family of Constantine, writes that the vast output until 340 was followed by very few, or even no, copper coins issued for six years, with small issues resuming in 347-348 followed by the massive issue of the "FEL TEMP REPARATIO" reform of 348. RIC Nicomedia -- but see Cyzicus 53. Rome and Constantinople come paired on a very rare commemorative issue of 347-348 with "P" and "R" (POP ROMANVS) on either side of a standing figure. P R either side of Pax standing left holding branch in right and long scepter in left. RIC VIII Rome 106. This type is only from Rome with only two varieties, head laureate and head pearl-diademed. Both are listed as "R4", which is extremely rare (2-3 known in 1981). P R either side of helmeted soldier standing right holding spear in right and resting left on shield. RIC VIII Rome 104. This type is only from Rome and only this issue, with no officina number. It is listed as "R4", which is extremely rare (2-3 known in 1981). Note for collectors: Both these are rare and seldom offered. They command a large premium. Varieties of the main types. The two main types occur with various marks in the field, few of which have any historical meaning that warrants special attention. The most interesting variant has a chi-rho as an early Christian symbol. The chi-rho occurs only at Constantina (= Arelate = Arles). The usual type but for a chi-rho in the reverse left field. 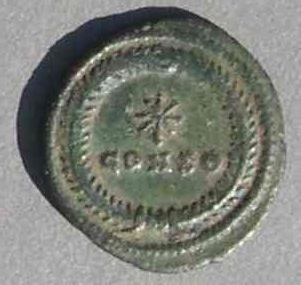 PCONST, for the mint Constantina, which was Arelate (Arles) under a new name. The usual type but for the chi-rho Christian symbol between the two stars on the reverse. Note for collectors: The chi-rho is probably on less than one in a hundred of the coins of these types. 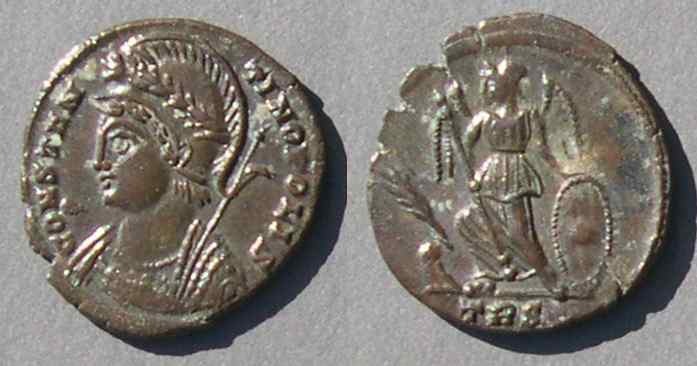 That, and especially its important historical connection to early Christian coins (see here for a site on early Christian symbols on coins), cause it to command a large premium. 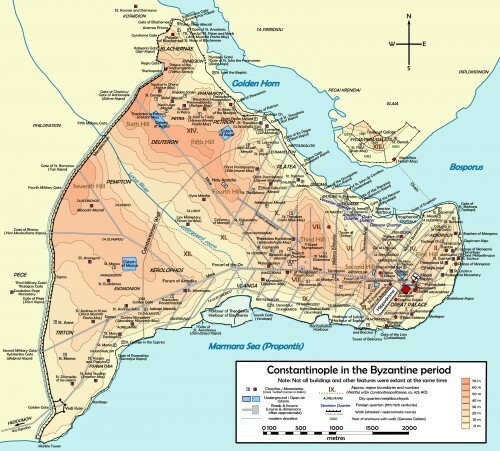 The CONSTANTINOPOLIS type comes spelled without the terminal "S" at four mints(Constantinople, Cyzicus, Heraclea, Nicomedia) located around the Propontus (Sea of Marmora, near Constantinople). According to John Kent (author of RIC VIII) this "reflects the fall of the terminal -s in the spoken language and provides an interesting hint as to how instructions reached the engravers." I presume he means that he thinks those four mints received instructions from the same source, there was a oral stage in the transmission, and it was a regionally accepted pronunciation. The missing "S" sound reminds me of modern French pronunciation. CONSTANTINOPOLI, without the terminal "S"
Otherwise, this is the usual type. The prow on the reverse is much clearer on this example than on most. It shows not only the prow but four banks of oars as well. At the Alexandria mint one variety of VRBS ROMA has letters outside the stars. The usual type except for the letters "S R" outside the two stars. What the letters mean is unknown. 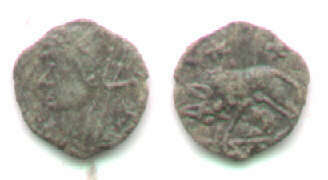 RIC VIII Alexandria 10. Struck 337-340. Note for collectors: The above two coins show a variant obverse legend, a clearer galley, and unusual reverse letters. A specialist will care and pay more for them, but not much more. Full flan, but only 15 mm and 1.66 grams. RIC VII Lyons 246 footnote.. This obverse legend variety is not supposed to appear at western mints (RIC VII page 138) , but this coin shows it does. In hand it is immediately obvious that this coin is smaller in diameter than usual. There are many more variants. One is an VRBS ROMA with three dots arranged vertically between the stars. Could they represent the three sons of Constantine? Maybe, but how could we really know? John Kent (author of RIC VIII) discusses medallions commemorating the foundation of Constantinople in an article referenced at the end. These types were very commonly imitated in Britain. I have personally seen, at Oxford, a scholarly collection of over 400 VRBS ROMA ancient imitations that was being classified to find die links between examples found in various locations. Imitations range from rare full-size imitations to extremely common small imitations, some of which are tiny. 14 mm. Bright green patina. Good style, even green patina, crude lettering. Note for Collectors: At any English coin show, even small local shows, you are likely to find very many of these (maybe hundreds), most in lesser condition than these illustrated here. I do not know about continental shows. Most are close to worthless and only the very best sell well, and those for about as much as a comparable original. CON..../wolf and twins, mintmark not legible. 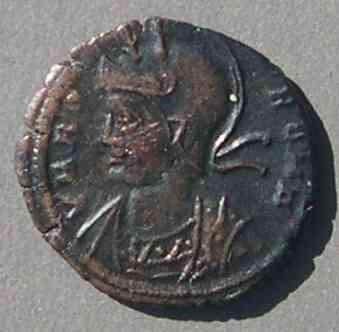 Blundered obverse legend, but likely VRBS ROMA was attempted. A mule. The reverse is the Victory of the CONSTANTINOPOLIS type. Mintmark, if any, is off the flan. The head would be of Constantine II, Constans, or Constantius II. Even very common coins are interesting. The fact they were common proves they were important--and therefore historically significant--in a way that rarities are not. When Michael Grant was president of the Royal Numismatic Society he devoted a presidential lecture to "Very Common Coins" and their relevance for understanding propaganda and the pattern of Roman coinage. The foundation of Constantinople had an immense influence on the ancient and medieval world. There are few types more historical than CONSTANTINOPOLIS. Imagine what such an important type would be worth if it were combined with great rarity! 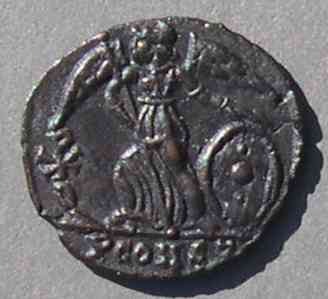 Rejoice that, instead, it is one of the most common ancient coins of all. 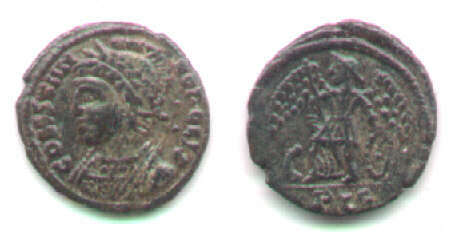 RIC VIII, Roman Imperial Coinage, volume 8 (after 337, the death of Constantine).